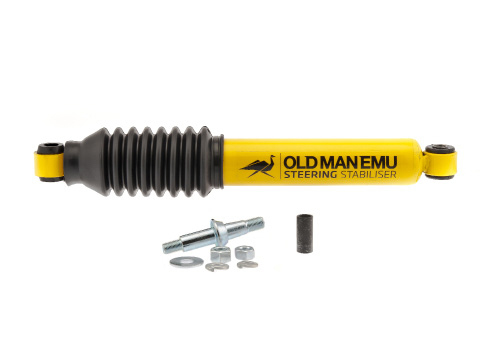 As another integral component of Old Man Emu’s four-wheel drive suspension range, steering stabilizers are designed to reduce the effect of wheel vibration and improve the feel, handling and control of the vehicle. They will also reduce the aggressive rotation of the steering wheel over rough roads without affecting steering wheel return. After on-board and dyno testing the Old Man Emu engineering team have developed a steering stabilizer/damper with increased compression and extension damping performance. This improved performance will assist in the overall ride and control of the JK Wrangler. To provide clearance from other factory suspension components Old Man Emu have utilized a rubber dust boot instead of the traditional steel guard. The OMESD48 steering stabilizer comes with a fitting kit to suit both left and right hand drive applications. A benefit for left hand drive vehicles is that the stabilizer can be mounted above the tie rod, giving it greater protection in serious off road situations. For all LHD Jeep Wrangler JKs, a steering stabilizer fit kit (P/No. FK50) is required to relocate the stabilizer above the tie rod. By repositioning, this ensures the stabilizer is less vulnerable to damage as it is no longer the lowest part of the front suspension. The ARB application guide has been update and available on ARB USA’s website at www.arbusa.com.